We make the choice to live in or visit this amazing part of Australia for many reasons. Why are you here? Chances are the lush tropical rainforest environment is at least part of the reason. We know that rainforest is not just this wet green forested area; it is made up of sparkling streams, secret waterfalls, towering trees, tiny treasures and a rich variety of animals and plants of all shapes and sizes, ourselves included. This is our Kuranda neighbourhood. Some animals and plants are so unique to our neighbourhood that they are known as endemic species, meaning they are found nowhere else in the world! One such species is our local, endangered Kuranda Tree Frog (Litoria myola). At just 35mm (male) – 60mm (female) long, these tiny wonders call small pockets of Kuranda rainforest home, though not just any rainforest will do. The right habitat for the Kuranda Tree Frog depends on many little things being just right. Just as we enjoy living in certain conditions, Kuranda Tree Frogs need particular conditions. Interestingly, these frogs need clean, gentle flowing riffles in rainforest edged streams to breed, with the males calling from favourite perches above the stream, enticing the females out of the surrounding rainforest, high up in the trees. As residents and visitors, we expect our neighbours to respect us as we would respect them. You wouldn't dump your rubbish or chemicals in your neighbours’ back yards, just as you wouldn't expect them to clear the trees in your yard or fill your creek with sand instead. Kuranda Tree Frogs couldn't cope with any of these actions either. There are threats to their habitat This is why we are focussing on creating and maintaining a frog friendly neighbourhood. It is important we remember to respect all our neighbours so our neighbourhood will continue to be such a great place to live and visit. We hope to report the continued good health of our rainforest streams and the health of the frog population through our long term frog-monitoring project. Learn how you can make your property a refuge for frogs and other wildlife. The aim of this monitoring project is to mitigate degrading frog environments. Of course, frogs are just the iconic species that indicate unseen environmental decline that can eventually lead to decline in other species, including human health. In October 2012, Kuranda Envirocare received funding from The Mohamed bin Zayed Species Conservation Fund (MBZ) to monitor [link to About the project/monitoring page?] the Critically endangered Kuranda Tree Frog (Litoria myola) and other endangered frogs in the Kuranda habitat. Volunteers identify frogs, primarily by their calls. We also encourage YOU to listen out for the three target frogs identified by these calls and we would love it if you reported your location, time and date to us. Kuranda Envirocare will coordinate the monitoring and manage the data. Both Kuranda Envirocare and Dr Hoskin will collaborate on analysing trends in the data. This grant will initiate the monitoring and fund the first 3 years and then other funding sources will be sought to continue the monitoring for at least 10 years. This will be the first long-term community frog-monitoring project that we know of in Australia and certainly northeast Queensland. 3. The frogs that need help are those that use the streams. The pond breeders are doing just fine. 4. Frogs are an excellent gauge of environment health. 5. Healthy frog populations indicates healthy populations of other species. 6. Frogs are iconic and locals and tourists love them. Looking after stream frogs is easy. They just need healthy streams and some rainforest. And they need everyone to be careful about what happens upstream. Why mention frogs in particular? The presence of frogs, especially endemic frogs, is an excellent gauge of the health of our rainforest ecosystem and waterways. They are also an iconic species, tourists and locals alike associate frogs with rainforest. Keeping frogs healthy will mean the rest of the environment is healthier too. What happens upstream flows-on so let's make our Frog Friendly philosophy flow-on too! The Mohammed bin Zayed Species Conservation Fund grant for the long-term monitoring of the threatened Litoria myola (Kuranda Tree Frog) follows on from previous grants to support habitats for endangered species in the Kuranda region such as the Mobile Muster. A Community Action Grant from Kuranda Envirocare has also been successful in achieving a Caring For Our Country (Aust’ Govt’) Community Environment Grant 2013-2014 called the Frog Friendly Face for our Local Jum Rum Creek. This project will provide further restoration work to Jum Rum Creek. t will also facilitate an education program for local landholders who may not be aware of the frog’s critically endangered status and will highlight activities that may contribute to frog decline such as sediment runoff or feral animal impacts. A frog information booklet is now available and with this, landholders can apply to have their properties assessed for inclusion on a local register of frog friendly properties. In a report on the disappearances of frogs in Australia, Campbell (1999) [link here to pdf] estimates that 13% (27 species) of Australia’s frog fauna are threatened, and of these, 8 species may have disappeared altogether. An additional 14 species give cause for concern. For most of these species, the causes of decline are not known or are poorly understood. Currently, we know little about what components of stream health impact on frogs in this region or in Australian streams more broadly. o A national working group for frog conservation is established. 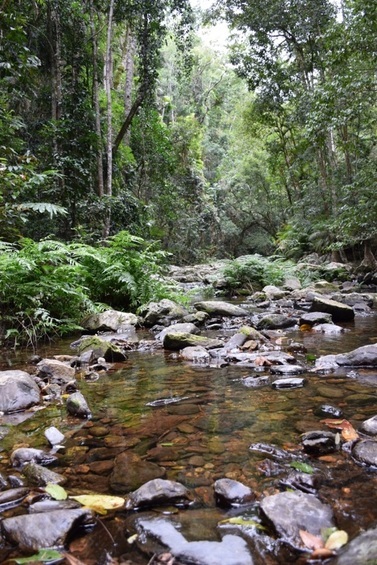 This is why Kuranda Envirocare has made frog habitats a priority for riparian restoration and stream health. Campbell, A., (Ed.). 1999, Decline and Disapperances of Australian Frogs, Environmental Australia, Canberra. ​Hoskins, CJ. 2007, Description, biology and conservation of a new species of Australian tree frog (Amphibia: Anura: Hylidae: Litoria) and an assessment of the remaining populations Litoria genimaculata Horst, 1883: systematic and conservation implications of an unusual speciation event., Biological Journal of the Linnean Society, Vol 91, pp 549-563.